This is the story of a young U.S. soldier who made the ultimate sacrifice for our freedom here in Europe. When I started out my search for the person in the grave, I just wanted to know how old the person was when he got killed. But when I found out he had the same age as I have now, I grew eager to learn more about this soldier, who died too young. 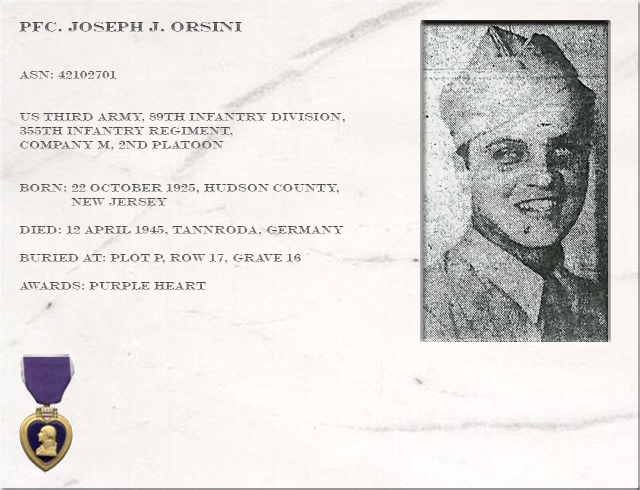 Joseph James Orsini was born at 22nd of October 1925 as the second son of Frederick J. Orsini Sr. (September 23, 1899- June 17, 1978) and Theresa McKeever Orsini (?-1985). 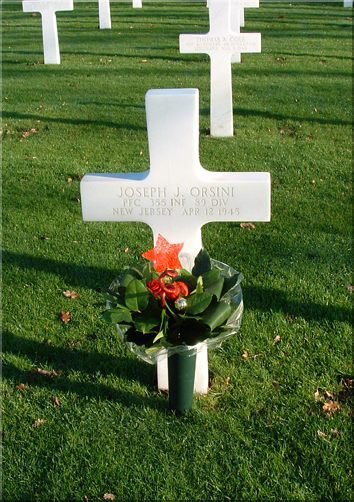 Joseph had a one-year younger brother, Frederick Edward Orsini Jr.
Joseph’s father, Frederick Sr., had both Italian parents and his mother, Theresa, had an American father and Swiss mother. Joseph was presumable born in Jersey City, Hudson County, New Jersey. He always lived in a section of Jersey City called the Heights. In the course of his young years he lived in two houses, first at Zabriski Street and later on at Lincoln Street. He began grammar school in September 1932 and graduated in June 1940. Joseph attended at Public School #25. He started as a good student, his intelligence was measured as a little above average (IQ of 130). After graduating from grammar school he went to Dickinson High school, Jersey’s oldest High School. Last year it celebrated the 100th anniversary. 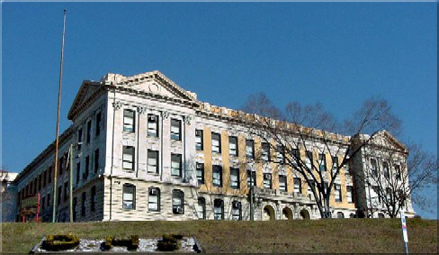 Actually, American singer Frank Sinatra also attended one year at Dickinson while his school in the next town (Hoboken) was being remodelled. Joseph took an Industrial course and failed his first half year at Dickinson High School and had to repeat it again, he pulled up all of his marks except Mechanical Drawing and he eventually dropped that subject. Finally, Joseph dropped out of school while still a freshman. He left High school near the end of his second year in May 1942. Before he entered the army in December 1943, he worked as a welder at the Caven Point Yard. He married Dorothy Alice Orsini and together they got a daughter Linda J. Orsini. (This time period is yet to be researched). He enlisted in the army at 20 December 1943 in Newark, New Jersey at the age of 18. Joseph had his training in Camp Blanding, Florida and stayed in July 1944 at Camp Butner, North Carolina. Probably here he was assigned to the 89th Division. His wife and daughter stayed during that time in Durham, the closest city to the camp. Physically Joseph was approximately 5'6'' tall, with an average weight and light brown hair. He was loved by his comrades. Joseph came to the 355th Regiment as a replacement private and driver of a jeep. Joseph suffered from night blindness so he only drove during the day. The day of his death the infantry and part of the 355th were in front of the jeep column and were heading towards a mountain. The jeeps were on a road to the right of the mountain and planned to meet up with the infantry. But then the column of the jeeps got ambushed. The Germans were using artillery and machine guns when the jeep of Joseph was hit, Joseph died instantly. Sergeant George Sauley who was in the jeep with Joseph tells; ‘from a save distance we could see 4 German tanks shooting and spraying with machine guns. The US bazooka guns used against the German tanks were part of the infantry ahead of us and we had no defence against the tanks. We headed back to the nearest town to replace the 5 jeeps we lost and returned to the unit with replacement British jeeps. Joseph's death took place near the end of the war. In fact, we should meet the German soldiers surrendering on the road before and after Joseph's death’. 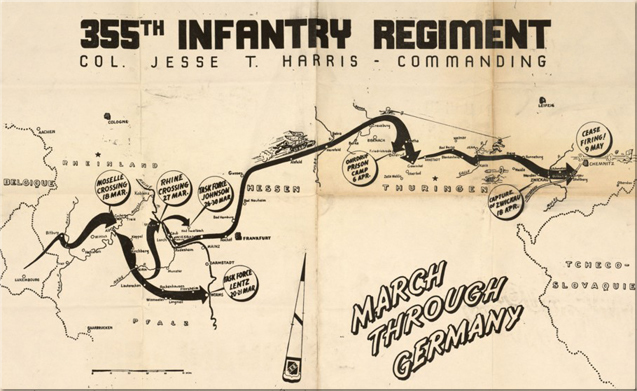 What happened on that fateful day when Joseph died is also described in the War Diary of the Third Battalion of the 89th Infantry Division. ‘The next morning (April 12) we pressed our drive to the east through a wooded section bearing southwardly to clean out an enemy pocket. I was on the left, K on the right and L in reserve with elements of M company attached to attacking companies. Intelligence reports indicated a concentration camp in the woods which I company found empty. K Company’s leading platoon surprised three enemy soldiers preparing to dynamite a bridge leading into Tannroda. 2 escaped the third was captured and Capt. Brown gave him the choice of removing the demolition from the bridge or being shot. A 1000 pound aerial bomb was speedily removed. A temporary battalion CP was set up in Tannroda and the town cleared by K and L. a Volksturm warehouse containing many rifles and burp guns and cans of jam was found. The kraut jam tasted good on K ration crackers. Because of the dense forest radio communication was inadequate and contact with I was poor. About noon a messenger from HMGplatoon attached to I reported that they had run into enemy infantry supported by tanks and in the skirmish had lost 4 M Company and one I company jeep. Due to inaccurate map directions we were unable to send aid. Actually I attacking through the woods encountered a road block. The four elements had no difficulty by passing it but the jeeps were turned south looking for a road. The map showed a road that could be utilized to by pass the block. Actually the road marked our right boundary and the 354th infantry attacking on our right at least 2 miles behind us. The German allowed 5 jeeps to turn on to the road and then opened up with Machinegun fire. Only one man, an M company driver was hit (Joseph Orsini). He was killed instantly. The rest of the men were able to scramble from their vehicles and take cover in the woods’. Joseph died at April 12, 1945 in the Tannroda area, which is at present day in Bundes-state Thüringen in the heart of Germany. At first he was temporarily buried on 14 April 1945 at the cemetery of Eisenach (Germany). 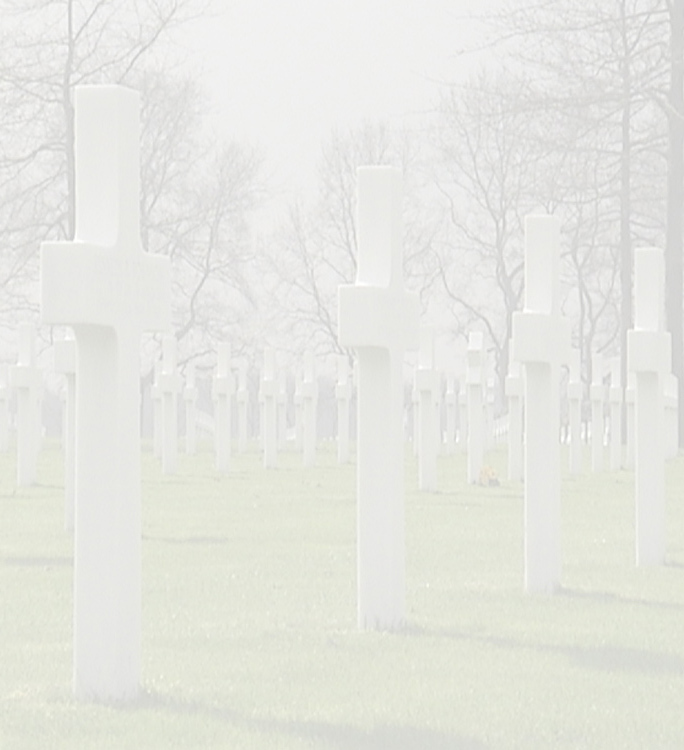 Later, Joseph found his final resting place on June 20th, 1945 at the Cemetery of Margraten (The Netherlands). He was awarded with a Purple Heart (posthumously) and the Combat Infantry Man badge. Mr. Sauley, Veteran of the 89th Infantry Division. Mr. Spaeny, Veteran of the 89th Infantry Division. Mr. Crouthamel, Veteran of the 89th Infantry Division. Mrs. Janice Brown, New Jersey GenWeb. And to all the other people who made an effort in helping me to put the puzzle of Joseph’s life together.